Nov. 1, 2017 8:05 a.m. The Uzbek immigrant accused of using a truck to mow people down along a bike path, killing eight, “did this in the name of ISIS,” police said Wednesday. Investigators, meanwhile, were at the hospital bedside of 29-year-old Sayfullo Saipov, working to extract information about the attack Tuesday near the World Trade Center memorial that also left 12 people injured, a law enforcement official said. The official, who was not authorized to discuss the investigation and spoke on condition of anonymity, said Saipov was lucid after surgery for wounds suffered when he was shot by police outside his rented Home Depot pickup truck. “It appears that Mr. Saipov had been planning this for a number of weeks. He did this in the name of ISIS,” Miller said, citing the notes. In the past few years, the Islamic State has been exhorting followers online to use vehicles or other close-at-hand means of killing people in their home countries. England, France and Germany have seen deadly vehicle attacks in the past year or so. “He appears to have followed, almost exactly to a T, the instructions that ISIS has put out in its social media channels before with instructions to its followers on how to carry out such an attack,” Miller said. Miller said Saipov had never been the subject of a New York police investigation but appears to have some links to people who have been investigated. In a number of recent extremist attacks around the world, the assailants were found to have been inspired but not actually directed by the Islamic State, and in some cases never even made contact with the group. On the morning after the bloodshed, city leaders vowed New York would be not intimidated, and they commended New Yorkers for going ahead with Halloween festivities on Wednesday night. They also said Sunday’s New York City Marathon, with 50,000 participants and some 2 million spectators anticipated, will go on as scheduled. “We will not be cowed. We will not be thrown off by anything,” Mayor Bill de Blasio said. In Tuesday’s attack, Saipov hurtled down the bike path, running down cyclists and pedestrians, then crashed into a school bus, authorities said. He was shot in the abdomen after he jumped out of the vehicle brandishing air guns and yelling “God is great!” in Arabic, they said. The dead consisted of five people from Argentina, one from Germany, and two Americans, authorities said. Nine people remained hospitalized in serious or critical condition, with injuries that included lost limbs and head, chest and neck wounds. 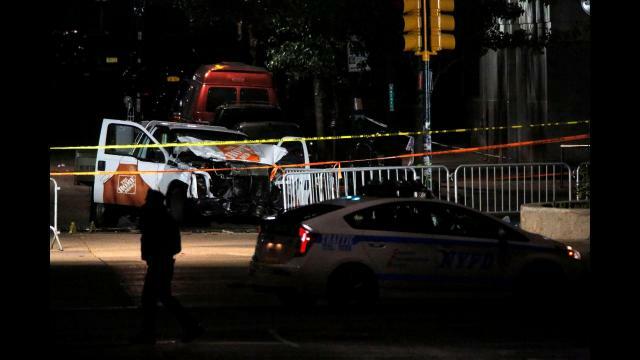 A roughly two-mile stretch of highway in lower Manhattan was shut down for the investigation. Authorities also converged on a New Jersey apartment building and a van in a parking lot at a New Jersey Home Depot. On Wednesday, the president took a swipe at the Senate’s top Democrat, saying Saipov came to the U.S. under a visa lottery program — “a Chuck Schumer beauty.” Trump urged tougher immigration measures based on merit. New Yorkers woke to a heavy police presence Wednesday outside the World Trade Center and at other locations around the city. Runners and cyclists who use the popular bike path for their pre-dawn exercise were diverted away from the crime scene by officers stationed at barricades just north of where the rampage began. Dave Hartie, 57, who works in finance, said he rides his bike along the path every morning. The slight, bearded Saipov is from heavily Muslim Uzbekistan and came to the U.S. legally in 2010, police said. He has a Florida driver’s license but was apparently living in New Jersey, they said. Records show Saipov was a commercial truck driver who formed a pair of businesses in Ohio. He had also driven for Uber. Muminov said Saipov lost his insurance on his truck after his rates shot up because of a few traffic tickets, and companies stopped hiring him. Muminov said he heard from Saipov’s friends that Saipov’s truck engine blew up a few months ago in New Jersey. Muminov said Saipov would get into arguments with his friends and family, tangling over even small things, such as going to a picnic with the Uzbek community. “He had the habit of disagreeing with everybody. He was never part of the community. He was always alone, no respect for elders, no respect for community,” Muminov said. He said he and Saipov would sometimes argue about politics and world affairs, including about Israel and Palestine. He said Saipov never spoke about ISIS, but he could tell he held radical views.